A puppet show, a 100-member flash mob, a 'Bombay Velvet' sangeet, and a retro reception were some highlights of Premita and Govind's extravagant wedding. 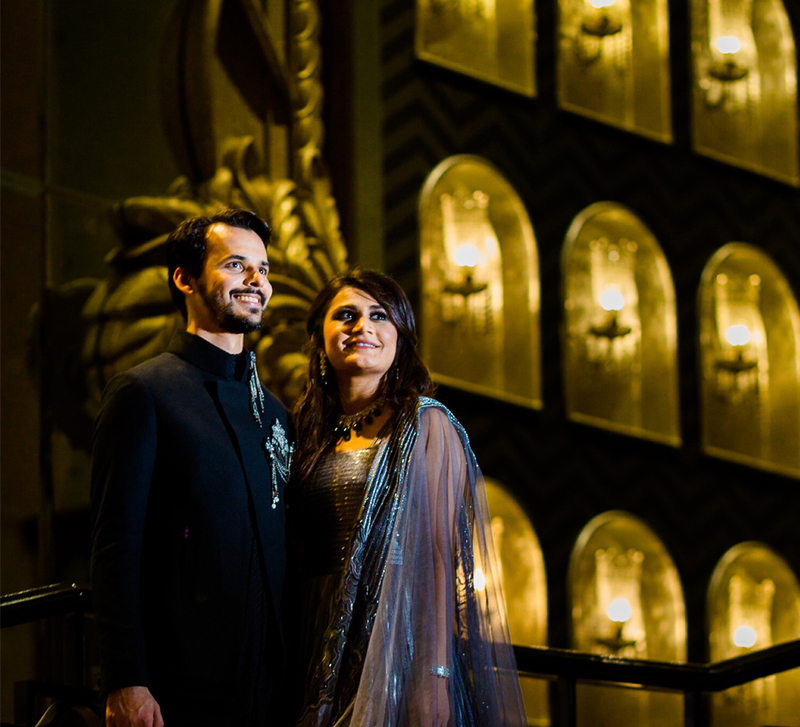 Steeped in opulence and hosted at palatial venues, Premita and Govind's wedding celebrations set a new bar when it came to the big vision for events and all the exquisite little details. Planned and executed by WeddingSutra Favourite - Rainmaker Events and Entertainment, the wedding wowed all in every way. Take a look for yourself below. Premita and Govind tied the knot at the auspicious Krishna Temple in Guruvayur, Kerala one monsoon morning. Soon after this solemn and intimate ceremony, the couple and their families were flown back to Mysore in four chartered helicopters. Themed ‘Prem Da Rang’ the mehndi function at the bride's residence was packed with games, interactive dances, and singing. The lawn was decked up with pink, mustard yellow and blue drapes and diwans that were accentuated with bright cushions. The setup also included a tea stall that served freshly brewed tea and snacks. 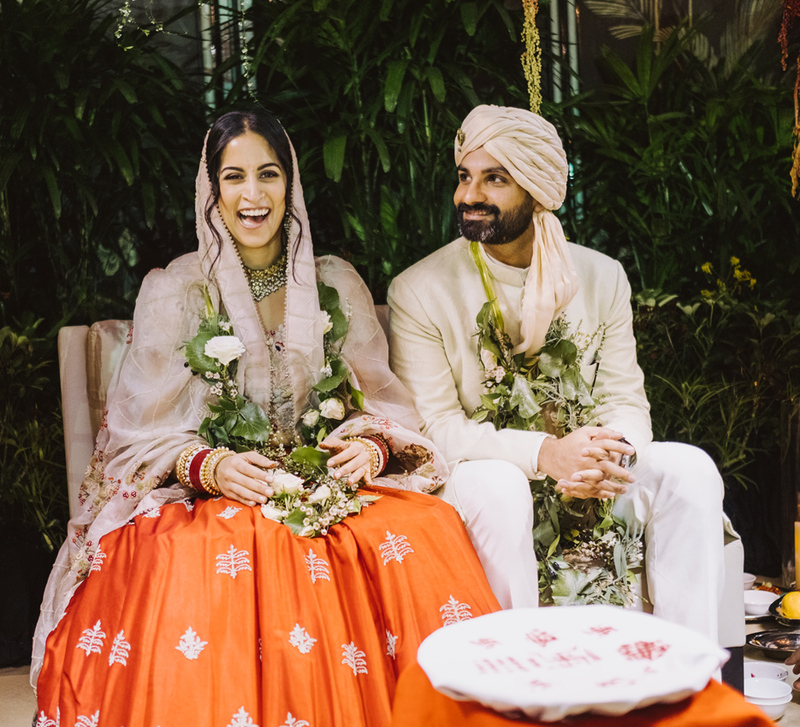 When it was time for the couple to go up on stage, they were escorted by a Punjabi dhol band and bhangra dancers who set the mood for a lively evening. The energy levels further spiked up when the music began to play, and everyone got to the dancefloor for the dandiya session. 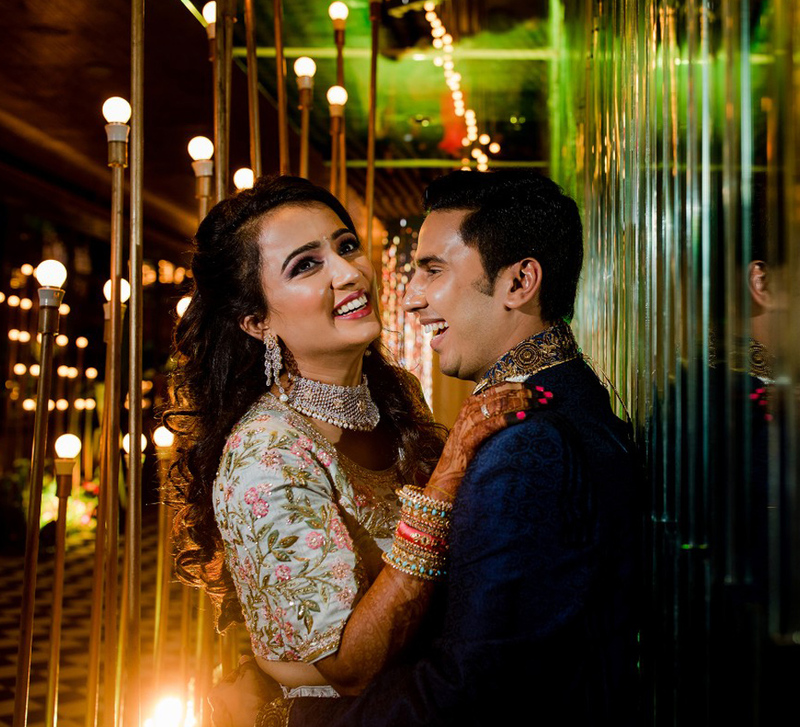 For their sangeet, a retro Bollywood vibe was created using vinyl discs emblazoned with movie posters, Edison bulbs, lighted vintage bird cages and custom hand painted Bollywood posters. Themed ‘Bombay Velvet’ their sangeet was one of the most memorable functions at this wedding. The couple made a grand entrance along with dancers performing to a series of songs that showcased the evolution of the film industry over the years. The two arrived on a Vespa and joined the performers on the stage for the final song. Premita received a heart-warming surprise from her family who put together a video that featured memorable moments that they had spent with her. This induced both laughter and tears from the audience and the couple was overwhelmed. The puppet show where the wooden puppets were modeled to look exactly like the bride and the groom was another surprise for this duo. Engaging dance performances from the loved ones kept everyone glued to their seats and later, renowned playback vocalist, Anoop Shankar along with his band treated the crowd to some divine music for the rest of the night. The couple’s wedding was a grand affair for which the Lokaranjan Grounds of Mysore were transformed to look like a palace. A life-size cut out of the wedding logo perched on a lotus sculpture adorned the driveway, and a traditional 30-member Shingarimelam welcomed all the guests with ceremonial tunes. Upon reaching the welcome area, their loved ones were privy to a stunning marble pond with rose petals in the center and floral chandeliers above it. White, gold and red were used to deck up the venue where the highlight was the 40 feet high golden mandap that was decked with flowers and featured fountains shaped like elephants. The couple made their grand entrances to the mandap with the auspicious 'ashtamangalyam,' 26 'thaalam' girls dressed in Kerala mundu sarees and the nadaswaram players. Once the Kalyana Soughandiam, which is a traditional Kerala Hindu wedding was over, the couple was surprised by the family yet again with a 100 member flashmob around the mandap. 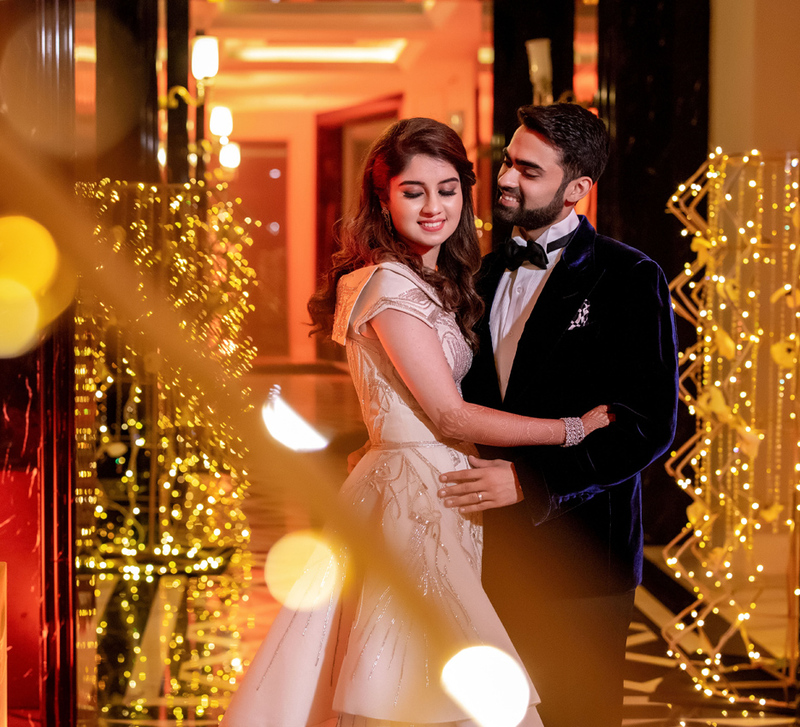 Premita and Govind ’s reception was held at the iconic Lalitha Mahal Palace Hotel where a tunnel of fairy lights led the guests to the event entrance. Here they were greeted by a large LED wall depicting the mood of the evening and servers clad in regal costumes who offered them welcome drinks. The Gatsby-themed stage featured two staircases with lion figurines at the end. Above the stage hung an elegant ornamental chandelier adorned with colored glass balls. Vintage candle stands, hanging geo terrariums, flowers and Edison bulbs, on the other hand, made for the table decor. The couple made their grand entrance in a 1950 model vintage car, and dancers dressed in costumes reminiscent of the 1920s accompanied them. The guests were entertained by a 26-member multi-lingual band called The Indian Epic Project. They ensured the dance floor was never empty. Professional dancers also kept the guests engaged until the night came to an end with a magnificent display of fireworks that lit up the night sky.